When California hears us questioning her total awesomeness, she’s like, “Hold my beer.” Bam, she summons up a wild and wonderful floral display which leaves the flower children dancing in the streets. 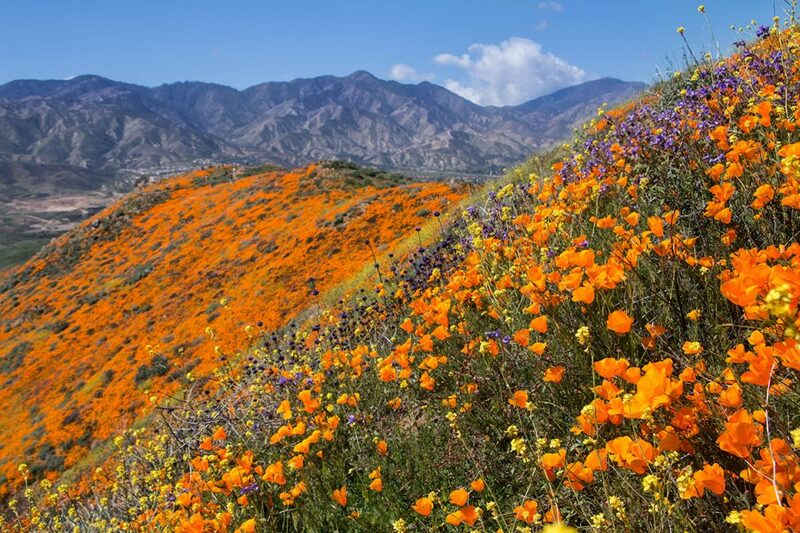 Superbloom 2019 is in full swing. 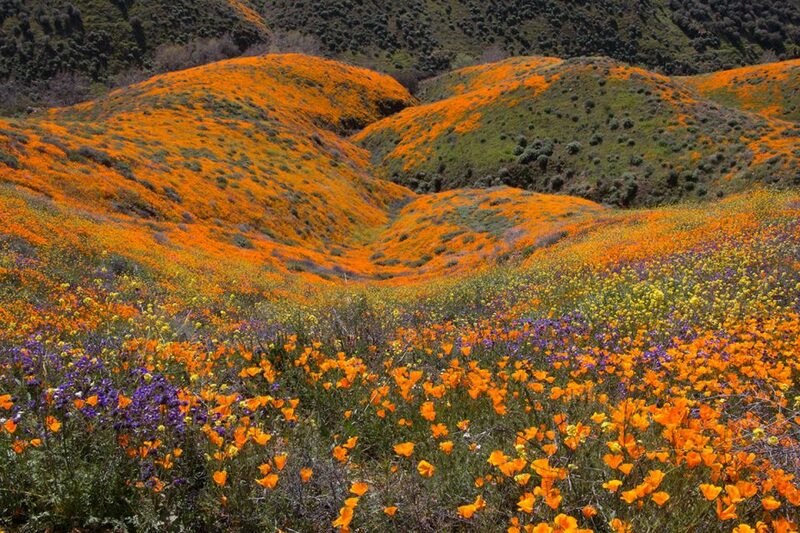 From the Carrizo Plain to the Anza Borrego Desert, the hills are alive with fields of flowers. 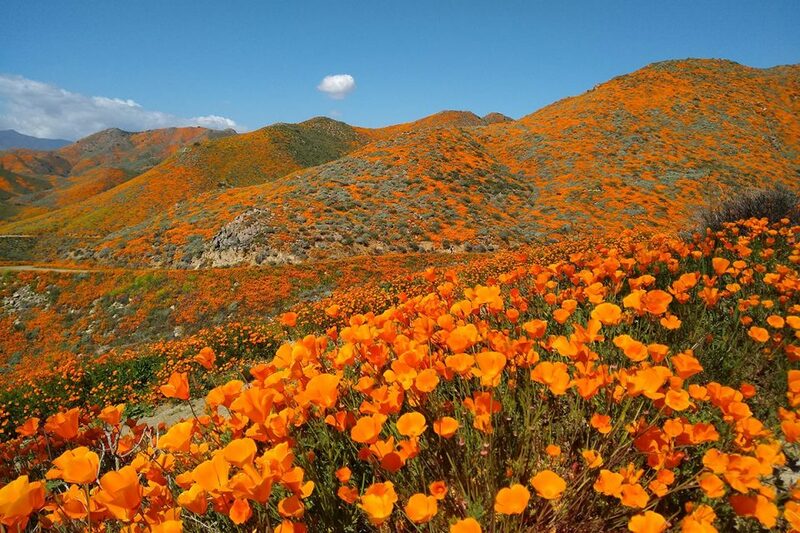 While the surreal floral display is occurring across the southern half of the state, this year’s undisputed pièce de résistance is the orange poppy-plastered mountains of Walker Canyon, a little known destination north of Lake Elsinore. Beautiful is an understatement. 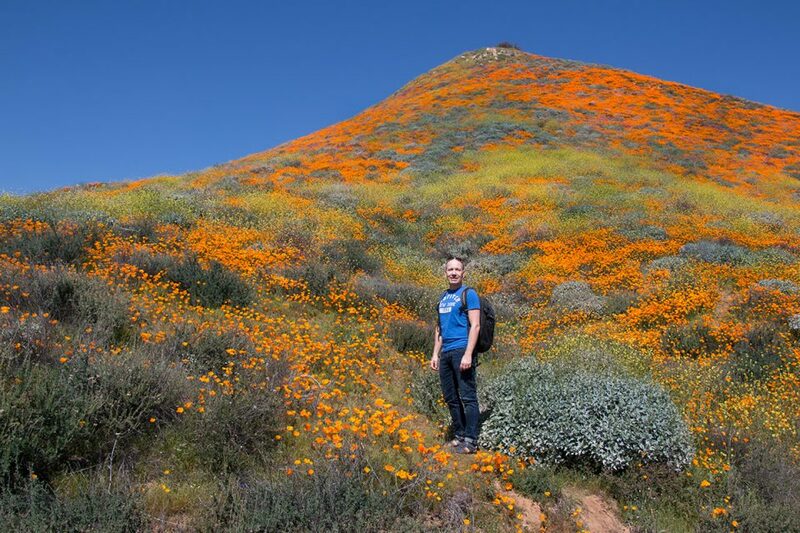 Thomas and I first heard about the superbloom several weeks ago when images of the the flower fields at Walker Canyon first started popping up in blog articles and Instagram posts. Immediately, we jumped in our car and sped up to the scene of the natural phenomenon; however, for reasons we will explain below, we waited to post these pictures. 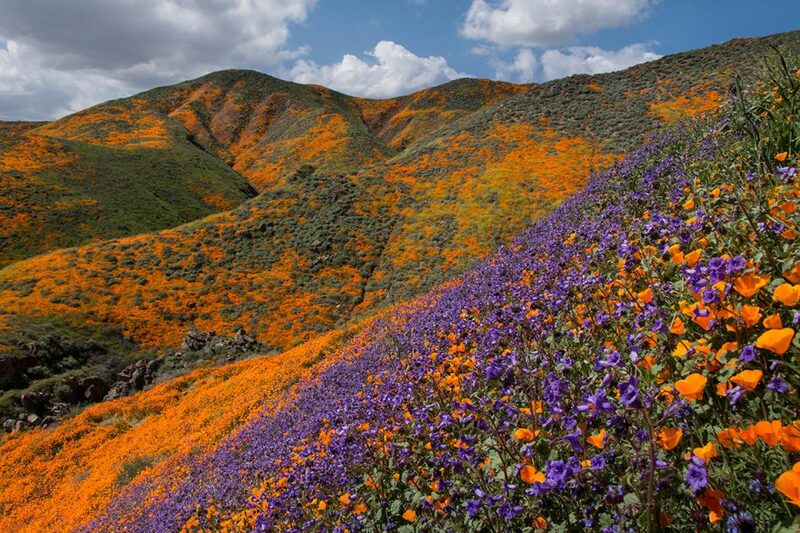 As we drove from San Diego up to Lake Elsinore, we saw signs of the epic bloom everywhere. 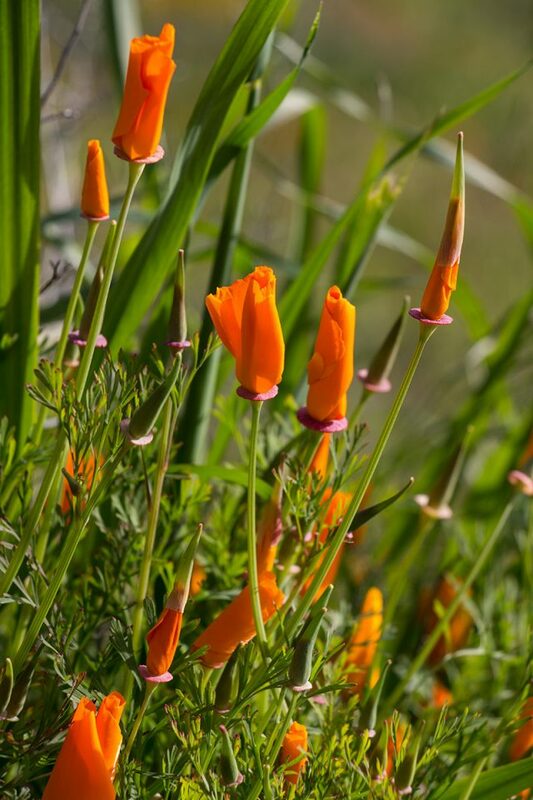 Freeway dividers, shoulders and the surrounding countryside were filled with patches of orange poppies, bright purple ice plant flowers, and yellow hillside daisies. But nothing prepared us for our first glimpse of the bright orange mountains north of Temecula – we’ve literally never seen anything like it anywhere on planet Earth. As we hiked up into Walker Canyon itself, the poppy fields became lusher and denser. The entire mountain range was a surreal orange canvas with floral brush strokes of yellow, green and purple blossoms. 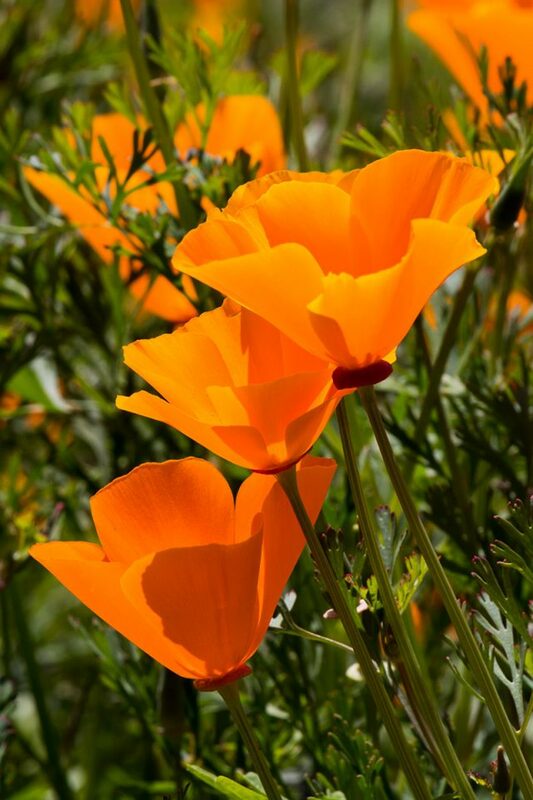 The hot orange of the poppies punctuated with the seemingly desaturated browns and greys of the desert bushes played serious tricks with your eyes, an effect that was made even more dramatic by clear blue skies. I think the picture of me below really captures that. The weird color play was most dramatic early in the morning just as the poppies were opening. That’s when the deep, deep orange was at its best. The picture above was shot just after we arrived. Later in the day, after the poppies opened, the fields settled into a bright florescent orange seen in the background of the picture below. Even stranger, when you turned around and looked west towards Santiago Peak, the stark browns and blues of the coastal mountain range seemed to exist in a world of their own. No orange, no yellow, no purple. The shadowed valleys seemed to exist in a semi-arid parallel universe separated from the superbloom of Walker Canyon. Rainfall is a mysterious thing, isn’t it? Thomas and I explored the canyon for around seven hours. We hiked high up into the mountains discovering the upper ridges and side valleys. Flowers, flowers, and more flowers. Every time we reached a ridge or peak, new poppy-filled panoramas. By midday, the poppies were literally glowing neon orange. The light was so extreme that it was causing photos to overexpose in the same way that snow causes lighting issues. Amazing. The fantasy atmosphere was enhanced by waves of painted lady butterflies fluttering from poppy to poppy. 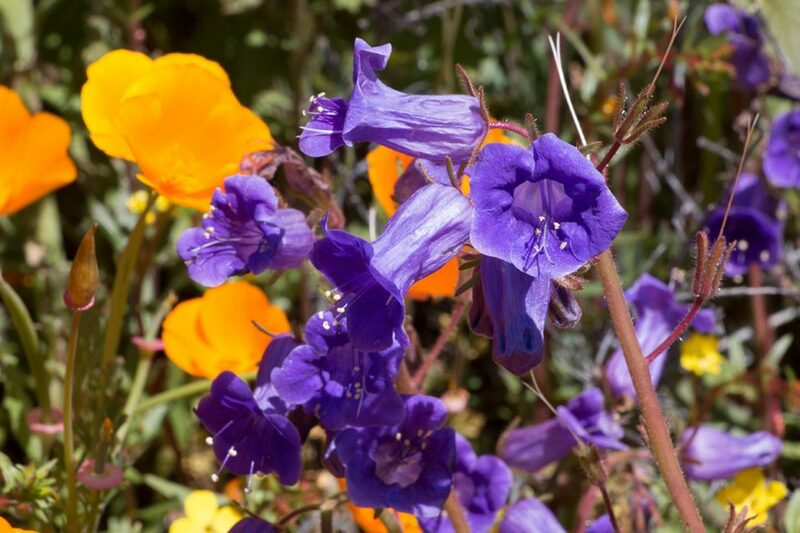 Apparently, Superbloom 2019 is translating into Superflutter 2019. And for most of our hike we had this dreamy mountain scene to ourselves! There was a supreme sense of isolation and discovery, which stood in stark contrast to what was going on below. Yes, we felt like we had the mountains to ourselves, but that was an illusion. As we hiked back down to the lower slopes, more and more people were gathering. Apparently, we weren’t the only ones reading those blog and Instagram posts. 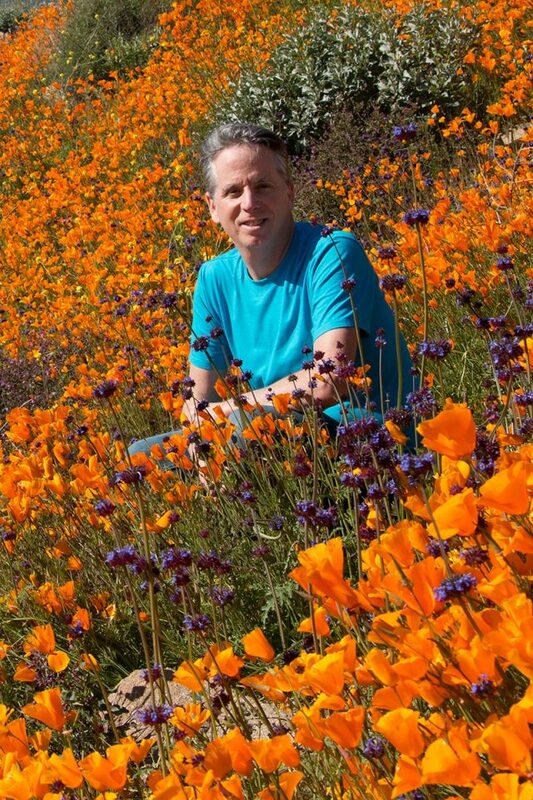 As one news article said, “every influencer in Southern California was heading to the poppies.” That turned out to be true. The further down we hiked, the more bizarre it became. Pouty-lipped millennials posed on every ledge. 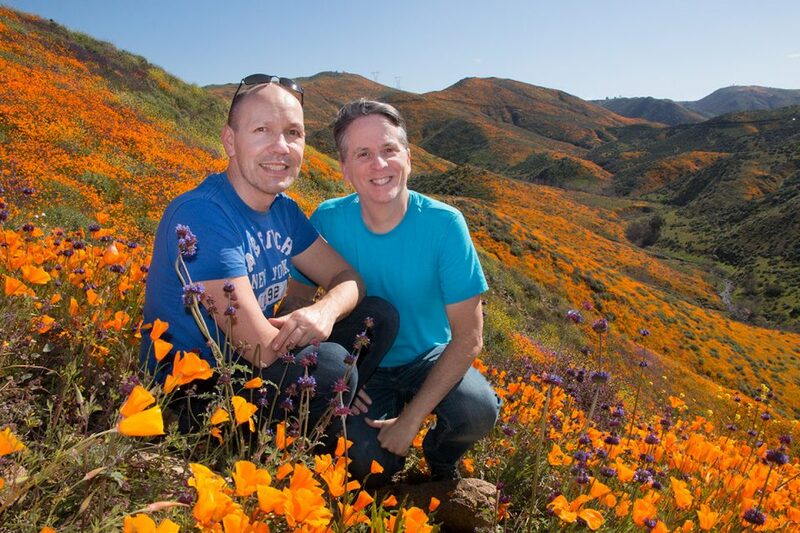 One shirtless gay couple (much younger and hotter than us) performed an impromptu photo shoot right in the middle of the poppies crushing the flowers in the process. Or were they live-streaming their flower destruction? I’m not sure. Further down the trail, there was an actual photo shoot of a woman in a wispy dress complete with lighting experts and make-up artists. It was both sad and hilarious. In the background, I heard a local hiker screaming, “Get off the flowers, get off the flowers. You’re killing the flowers!! !” I turned to discover her berating a Chinese tourist group who had decided to lay their jackets out over the poppies to have a nice rest. In the distance, we could see a mile-long line of cars waiting to exit the freeway to get to magnificent Walker Canyon!!! Over the next few days, coverage of the spectacular natural phenomenon playing out in Walker Canyon would snowball. 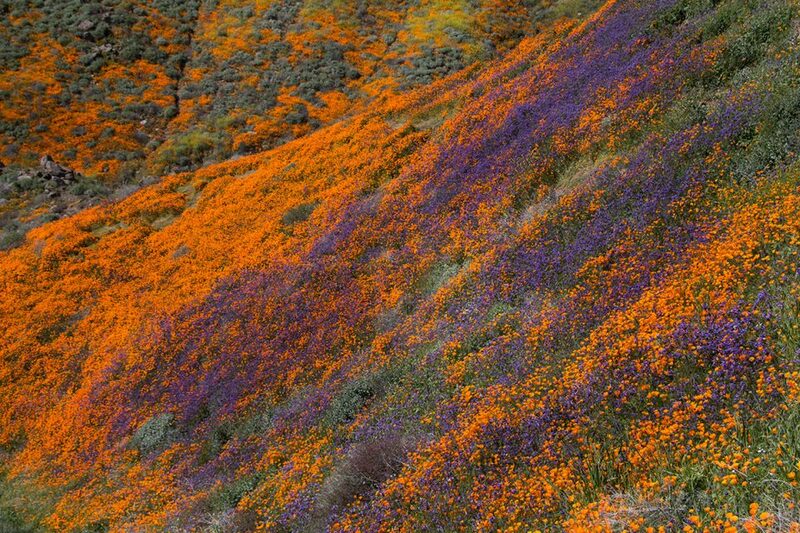 So many people descended upon the tiny, fragile reserve that Lake Elsinore locals would begin referring to the superbloom as #PoppyApocalypse and #PoppyNightmare. A week after our visit, authorities closed Walker Canyon to the public. 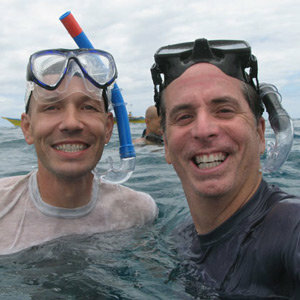 (Read BBC News’ report on Lake Elsinore’s safety crisis.) But even that couldn’t stop the flower-loving hordes. Apparently, people continued to leak in from every direction causing even more damage in the process, so authorities reopened the site. Welcome to mother nature in the age of social media. So this is why we have waited to post our pictures. We decided to let the #PoppyApocalyspe 2019 die down a bit. I think it is safe to say that the hysteria was justified. 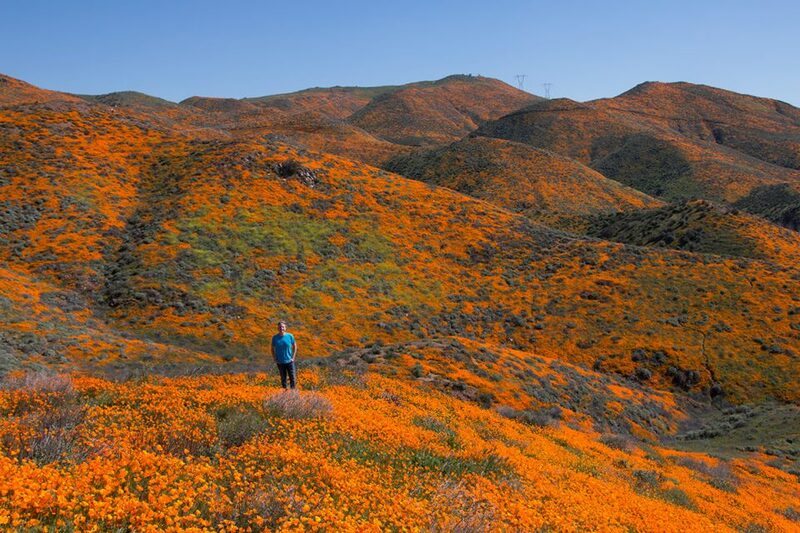 California’s superbloom is a sight to behold. And anyone who has managed to find a tiny slice of solitude during this magnificent event was rewarded with one of the greatest natural spectacles the floral world could conjure up. 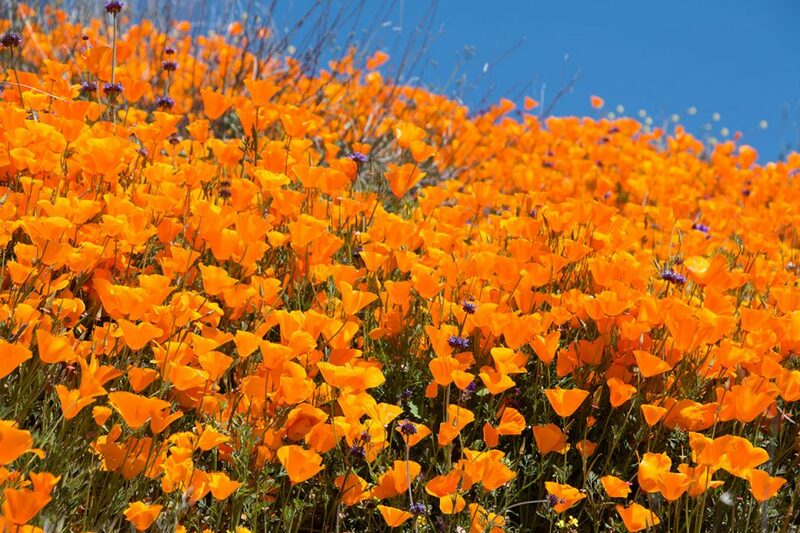 Do you know if the super bloom is still going on? Does it still look like this? These pictures were taken at the peak of the superbloom about a month ago. I can see on Instagram that there are still many flowers, but it’s gradually coming to an end.